At first I didn’t understand how my “stuff” was getting in the way of love. I didn’t see the connection, but my clutter, debt, and busyness was a big obstacle to living a life full of love. When the stuff was gone, I had space to consider what I loved. When the debt was gone, I had more freedom to explore work I loved. When the busyness was gone, I had the honor of being present and showing all the way up for the people I love. Does this contribute to your life in a loving way, or support people you love, work you love, or something in your life you really care about? Does this thing help you live a life you love, or encourage you to be more loving? Ask yourself if you are adding this thing, event, or commitment because it adds value or because it distracts you from pain; the pain of boredom, frustration, or uncertainty. Is there a better way to ease the pain? Keep coming back to the question. Is this love? If you worry that simplicity will be boring or empty, consider that what’s on the other side of your stuff is the life, work, and love you’ve been dreaming about. 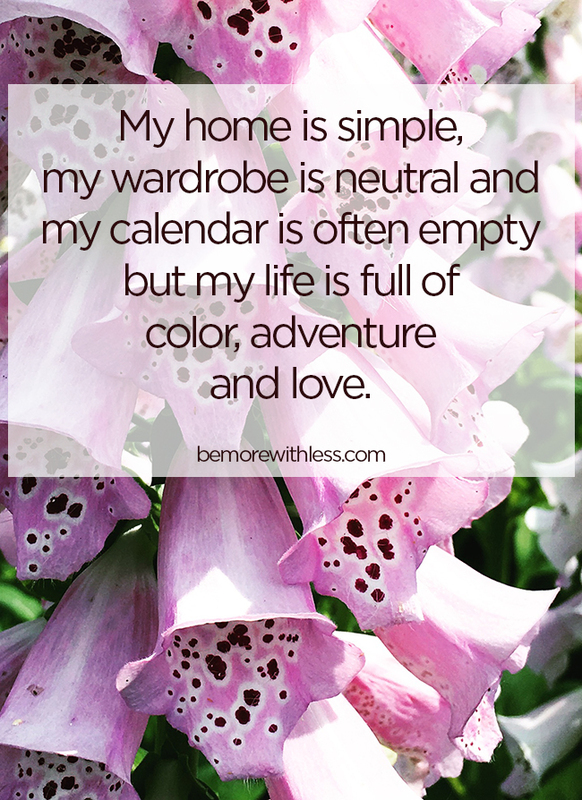 My home is simple, my wardrobe is neutral and my calendar is often empty but my life is full of color, adventure and love. I will always choose love over stuff. Perfect timing for this post! Thank you so much for taking the time to provide inspiration and points to ponder to others. One never really knows exactly how or when, they will change the life of another. I look forward to the next post. In the meantime, I will print this out and read, and re-read…and…re-read, until I absorb every concept. Many blessings to you today and each day that follows! Give it time and be gentle with yourself. You are starting to notice your habits and patterns and that is an incredible first step. I just want to say that this comment really struck a chord with me. I also do the fill your online cart and then leave the page game and thought that because I wasn’t hitting “purchase” I was being a good minimalist. But hearing you mention the time wasted this way suddenly made me realise I am still addicted to the distraction of shopping, even if I’ve broken the addiction to always having new things. I never feel like I have enough time for meditation and yoga even though they always make me feel good when I do them, but if I rescue the wasted time from online browsing I probably can fit this self care in instead. Thank you for bringing that point so neatly to my attention. Courtney, can you elaborate a bit more about what you mean by the busyness factor of stuff. I love this! And can also be applied to better eating habits, asking if reaching for a particular snack is love to my body or if it is me reaching for something else out of boredom or emotion. And certainly filling our calendar with “stuff to do” should be run through the grid of love always! I am in the process of clearing out the ‘stuff’. Things that my deceased roommate collected, things that I inherited, things that used to belong in the pile of “this could be useful… someday”. I have room to breathe. I have room to lay on the floor with my four-legged family. I have space. And I have no desire to fill it up with things, because it is already filled with love and joy. Courtney – THANK YOU. Your posts, and emails, and recommendations have made this part of my journey an adventure. This post is everything! This post was perfectly timed to what I want to achieve. It is really really hard to get my littles on board with me getting rid of things tho. I don’t ask them to get rid of their stuff, but things in the living room and kitchen they seem oddly attached to. I feel that if I get rid of it, they will see a calmer mom and it will all be okay. Because I am at the point where I would rather have more time with them than be busy dusting and moving around objects. Thank you for this beautiful and inspirational post. So very needed today and every day! Enjoyed your post Courtney. I have been slowly removing the unbelievable amount we have but have had wonderful inspiration from you and others. The capsule wardrobe 333 truly has shown me how minimalism works and I love it. My spouse will probably never be on board but admits to seeing some benefit. I will continue what I am doing. I am really looking forward to removing the time clutter- always too much to do. Courtney, thank you for sharing your insights. I’ve been following you since 2014 and I can attest it doesn’t happen overnight but with persistent commitment to one’s own happiness. The “Is this love?” question can be applied in my case as “is this loving toward myself?” If an activity or keeping an item is based on anything other than love….I thank it for fulfilling it’s purpose in my life, think of the joy I felt for it and wish that joy for the person who receives it next. I was at your Houston Tiny Wardrobe Tour last week. You are an inspiration and I loved meeting you and hearing your story in person! Your Project 333 course has dramatically improved how I dress and helped me to develop a signature style. Counting and donating the 150 hangers after doing the course was an eye opener! While I’m not quite at 33 items, I’m way closer…progress not perfection! Thank you , I am an ardent reader of your blog and its like you holding my hand, one step at a time i know I am getting there! I have been too busy (sic!) to read your news but this one really spoke to me. Hey Karin, I’m in the same boat. I recently took up a Mindfulness course and I’m learning a lot. Buying stuff might be a resistance to how things are in your life. What we resist persists so try looking at life , your life in a more detached way and let yourself be led to facing the loneliness etc in the eye. Embrace all that troubles you and see what lies beneath. I’ve been there, I am there. There’s lots written about the gold in the dross of our lives. Blessings! It does feel so much better, once you get over the hurdle of starting. I spent so much time living with a hoarder, that I thought it was normal, and my house was full of stuff – and it was full of laughter and frustration and joy and clutter. Once I started – it was like a magical experience. I would clear one room, then clean and paint and be mindful about what I put back in that room. It has taken me three and a half years to go through the entire house, and I have gone back to the original room I started with and removed so many things that I thought still belonged. I am still tackling the garage (detached) but, once I decide to go out there and do ~something~, it feels like a major accomplishment. So, the answer to your question is YES! Start small, but start. Not only wise but also beautifully written. Thank you for sharing your heart. I cannot express how urgently I needed to read this today. I have been getting rid of things only to attain more things soon after. Its not the things I need or want. Its the emotions and stress that I’m trying to mask by the next new shiny thing to distract me from dealing with the real issues in my life. So I begin again. I will hold the next thing and think why do I need this? Where will I put it? How many times will I really use it or wear it? And what am I trying to distract my mind and heart from expressing or feeling. Is this thing LOVE. Probably not. Thank you for this gift today. This post is very inspiring and perfect timing. Thank you. Thank you for this post. I wholeheartedly agree. My family is just starting out on our minimalism journey. We recently donated lots and lots of stuff. My children, ages 5 and 7, were way more cooperative than I expected. I’m having a bit of trouble with the next steps. Instead of feeling happy about the extra space on my shelves and more at peace, I feel like my home is less homey and I’m not sure how to organize what remains. I haven’t run out to buy more stuff, but I don’t feel settled. Any advice? Anyone else feel this way? Thanks again for your important perspective. Molly, I have been a collector of “old stuff” all my life and all my cabinets and shelves were full of it. Everything was on display as well as every piece of old furniture stuffed. I have been working on getting rid of it for several years. Maybe I was more ready than you, but the empty shelves felt so good to me. However, it truly can be a shock at first to see the emptiness. I think if you will give it time, you will adjust and love it. Looking at beautiful minimalist rooms online can help as well. LOVE this! Exactly what I’ve been working on for the past year or so. I still have a ways to go, but I’ve made great progress…one day at a time, one project at a time! Thanks for the inspiration! Inspiring post! We are in the middle of a big lifestyle change and move across the country. In the process of selling our house and buying a somewhat smaller one in an HOA community (yeah, no yard work or exterior home maintenance!) we have gotten rid of a huge amount of stuff. Mostly we gave it away which brought heaps of unexpected joy. Now to not fill the new home up. I’m a longtime follower of you Courtney and have learned so much from you and your readers, so here’s my two cents’ worth…the most difficult part of letting go was getting started (I promise!). For me, the process seems to have taken on a snowball effect and what once was a source of fear (what will I have left to wear? will I regret giving this away? will I have to replace this?) is now a sense of freedom and empowerment. It truly is about letting go and shutting out all that “noise” about how we are supposed to be. Deep cleansing breaths….thank you! I tend to buy thrift store clothes. I was surprised to find that I have much less than 33 items. I often think I will mend or alter items that almost work, and I often lose interest in some of the pieces, so I don’t have enough. The thrill of bargain hunting briefly distracts from negative feelings, but wears off in the long run. Something you said in answer to a question during your recent online question and answer session made me realize that a three month break from shopping would help, that I probably don’t know what I really like. This is helpful in letting go of habits influenced by having few choices as a child and teen, because hand me downs, discount clothes, or clothes I sewed myself, were the only options allowed then. Thanks for the insight. I also love thrift shopping – and although I do occasionally slip up and buy something that’s “not quite right”, I’m able to look back and see my progress. When I stopped thrifting almost every day I was faced with: what shall I do instead? I took up old hobbies, discovered new ones, and often just have a lovely morning at home, getting jobs done around the house. I now wait until I have a list of things I genuinely need before I go thrifting. I love this. I’ve been feeling I need to do a purge and get back to love in my life. I’m feeling trapped and weighed down by stuff, commitments and work. Need to work on cutting out the excess and figure out and focus on what I love. As always you are spot on, Courtney. Just what I needed for today! I really enjoyed reading this post. I am in a place where I am trying to really honor my inner messages, as opposed to the constant external messages that we are exposed to. To really pay attention to your needs and inner self is a challenge. I find meditation has really helped me, it gives me a place to practice listening to that inner voice.